As per this article, most sought after recipe videos that Indians search for on You Tube are related to chicken and most specifically “How to make chicken curry”. This was followed by the search for Biryanis and Paneer recipes. If we go by this data, Indians are slowly but steadily inching towards being a renowned food lovers. If cooking videos are on top 10 most watched categories globally, in India it jumps on to become top 5 and growth in viewership of food related videos is phenomenal 40% year on year. Well this clearly highlight, how much we love food and specifically chicken. 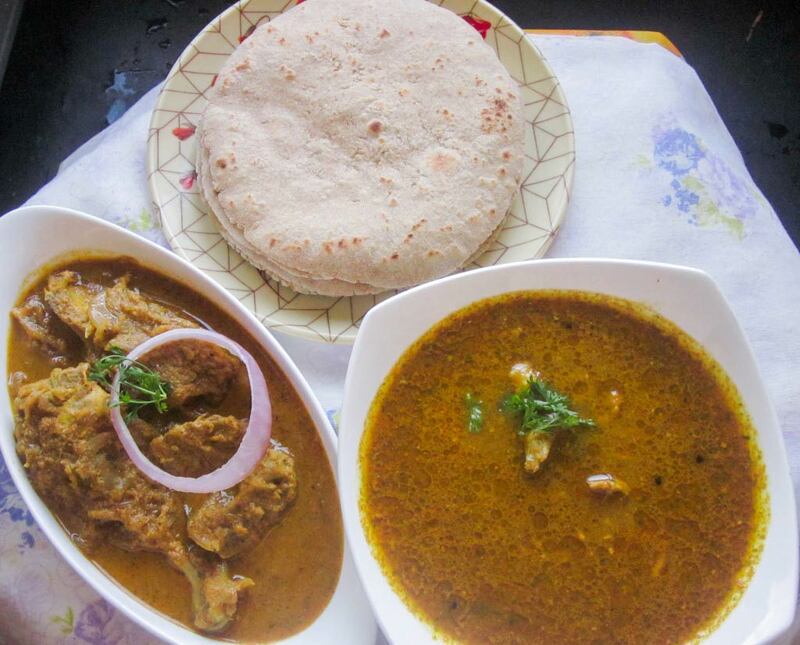 This weekend, we decided to prepare Kombdi Rassa(Chicken Curry) recipe which is a classic Maharashtrian chicken recipe.If you have driven through Maharashtra on National Highway, and have stopped by any roadside Maharashtrian Dhabas that serve Non-Veg food, you would definitely find Kombdi Rassa (Chicken Curry) as one of the highlights of the menu. The nutty aroma of roasted sesame seeds, dry coconut and roasted onion tantalizes you to step inside the Dhaba, lures you in occupying the seat and coaxes you to savor the deliciousness. 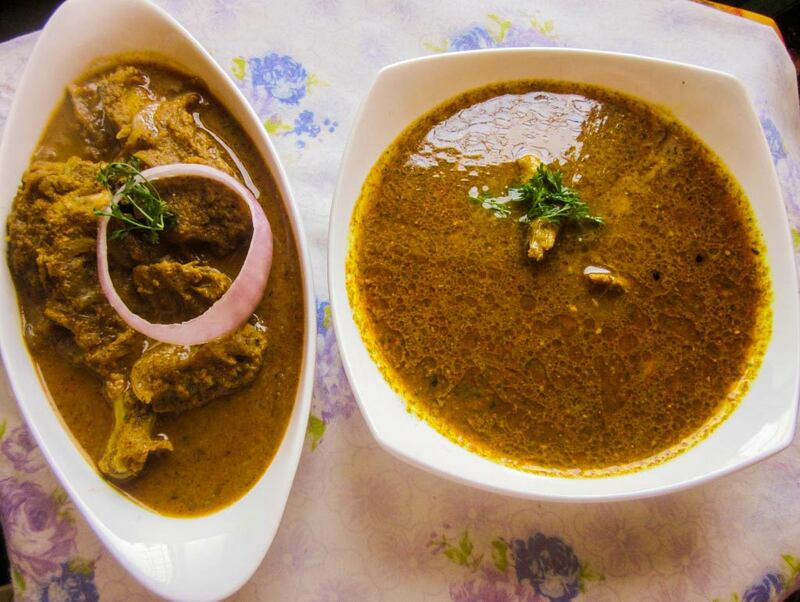 This is one of the signature dishes of Maharashtrian Cuisine.It is traditionally made with organic(Country/Desi/Gavthi) Chicken but you can also make this with Broiler chicken. Kombdi Rassa tastes awesome with “Jowar Bhakri” and steamed Rice. Prepare it in your kitchen and experience the taste of Dhabas at your dining table!! 600 gm organic chicken cut into medium sized pieces, clean and dried. Marinate the chicken pieces with turmeric powder and salt. Allow the marinated chicken to rest for 30 minutes. Dry roast cumin seeds in a pan until it turns brown. Dry Roast Sesame seeds until it turns light brown. Dry Roast desiccated coconut until it turns brown. Roast 1 large onion on direct flame. When Onion gets nicely roasted, turn off the flame and let the onion cool down. Let the roasted ingredients cool down before we make a fine paste using them. Take 2 tbspoon Oil in a large pan. Add 1 medium sized Onion finely chopped. Fry the Onions till they become tender. When Onions become tender, add Chicken pieces and cook them covered for 5 minutes. After 5 minutes add 2 cups of hot water and cook the chicken covered, until it is almost done. When roasted Onion cools down, peel off the skin and cut the Onion into large cubes. Do not wash it with water. Take all Roasted Ingredients in a Grinder along with ginger-garlic, fresh coriander and grind them into a fine paste making use of water. When Chicken is almost done. Remove the fleshy pieces in another plate for Chicken Dry/Sukka. Now the less fleshy chicken pieces left in the pan will be used to make Chicken Gravy/Rassa. Add 3 cups of hot water, 4 tspoon red chili powder, salt as per taste and ⅓ rd of Masala Paste. 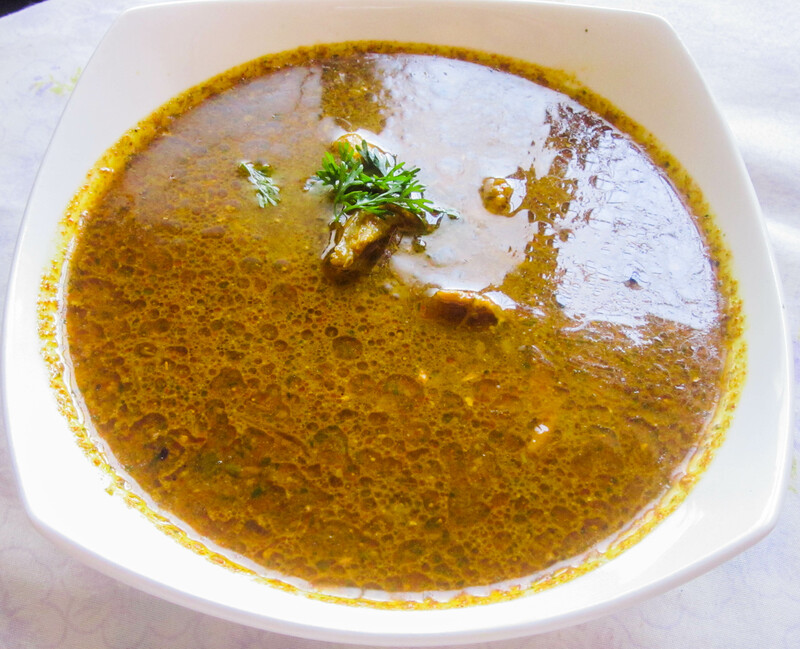 Cook the Chicken Gravy/Rassa on medium flame until one boil and then turn off the flame. Chicken Sukka is now ready. For Chicken Dry/Sukka, take 2 tbspoon oil in a pan. Add 2 medium sized onion sliced lengthwise to the pan and fry until it becomes tender. When Onions become tender add remaining ⅔rd of Masala Paste, 3 tspoon red chili powder and mix them well. Roast the masala paste for 3-4 minutes.Now add remaining Chicken pieces, salt as per taste and 2 cups of hot water and let the gravy simmer for 3-4 minutes on low flame. Chicken Sukka will be of thick consistency. After 3-4 minutes, when Chicken Sukka become thick, turn off the flame. 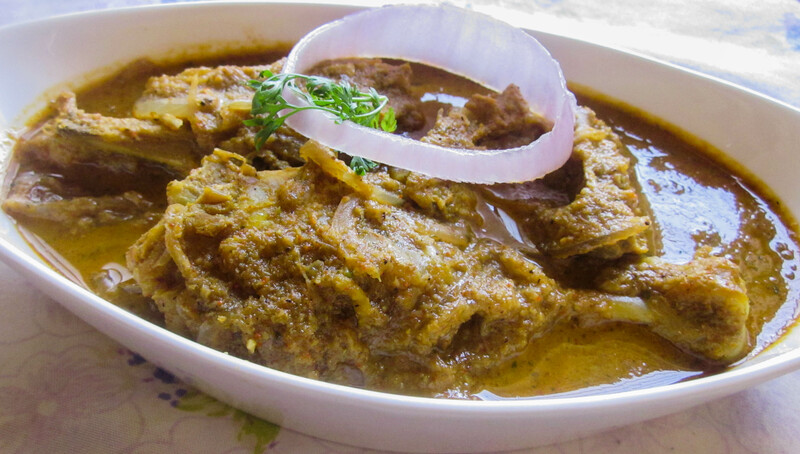 Gavthi Kombdi Rassa can be enjoyed with Jowar Bhakri and steamed Rice. I was looking through your recipes. They appear really good (I am getting ready to have lunch right now :-D) I just thought that they appear to be quite heavy on roasting, grinding, etc., considering most people today have rushed lives and so most people look for tasty but quick options, right? I would though like to try out your recipes when I have some time to do them properly. 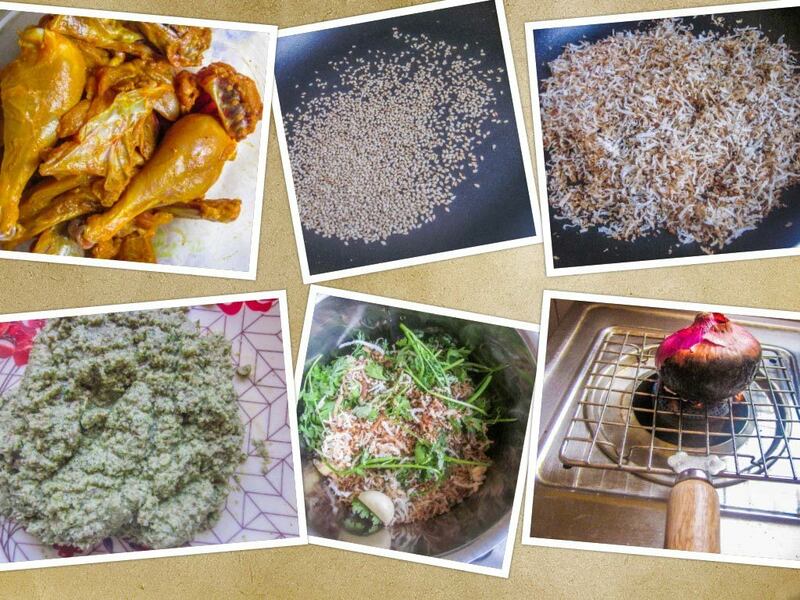 Thank you for taking the time out to share these wonderful recipes with beautiful pictures. Thanks Louise for visiting our blog and providing your invaluable feedback. Yes we completely agree that in today’s super fast world these recipes are quite time consuming. Its our honest attempt to keep these authentic recipes live in our kitchen through this blog. Thank you so much once again for your kind words of appreciation! Thanks David for stopping by and posting your feedback! Keep visiting, enjoy cooking!! Smita henceforth gona follow ur recipes ? What a lovely feedback! Made our day.. Please try this chicken curry, it comes out nice! 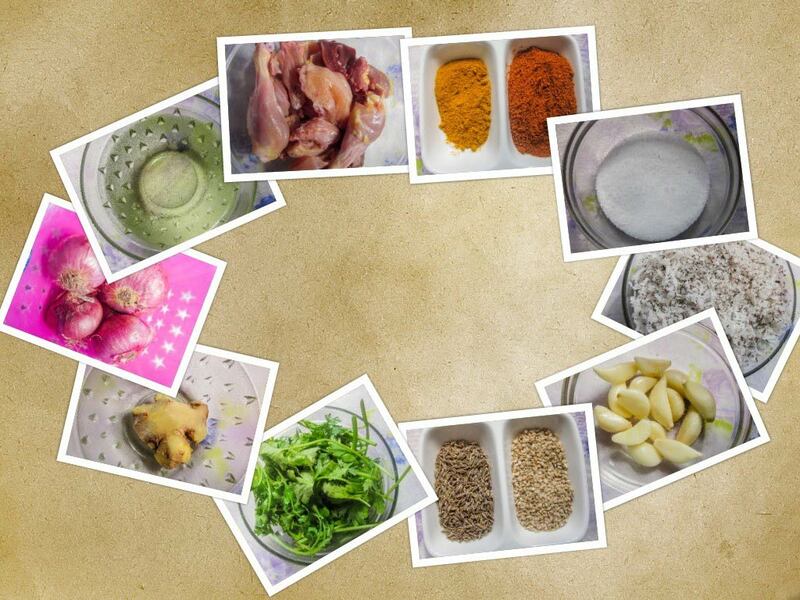 Your feedback is encouraging we will surely try to share the different regional recipes! Are you sure its 7tsp of chilly powder it will be very spicy.What kind of chilly powder did you use?Kashmiri or any other.Please let me know.Planning to make it soon. Thanks for stopping by and I am really glad to know that you are planning to try this recipe in your kitchen! I have used my homemade chili powder which is the mixture of kashmiri red chili powder and Byadgi chili powder. 7 Tsp is almost equal to 2 tbsp and this dish is quite spicy and the spices are balanced by usage of dry coconut. Still I would suggest you to reduce the chili powder or use milder chilies to suit your taste buds. Thank you so much . happy reading, enjoy cooking! Can I use thighs or breast.And how much quantity in grams please. Thrilled I found your blog! Yes the recipe is time consuming however to capture the authentic taste it is worth the effort. I haven’t been back to India for 14 years & today after replicating your recipe I was able to taste those authentic flavours one would taste when travelling through the ghats. I enjoyed the various steps of this recipe & recommend try it if you do have time as it is thoroughly worth the effort! Thank you so much for sharing this recipe & will definitely be trying more of your recipes.